I have a confession to make… I love Pinot Noir. There, I said it. Don’t get me wrong, I am extremely attracted to Zinfandel, especially when she is older and more experienced, you know, the cougar variety. I may lay in bed some nights thinking of the fair golden beauty of Chardonnay. I’ll always think fondly of Gamay as if she was my childhood “girl next door” crush. And Cabernet will always be the one that got away… the one I naively thought was my first love, only to find that as I grew older we grew apart. Ah, but Pinot Noir. Deep down inside, in the very core of who I am, I just know that Pinot Noir will forever hold my heart. Why, you ask? I’ll tell you why… because she is frisky, and temperamental, and very picky. She’s not an easy one to woo, oh no. She knows what she wants and when she wants it, and if you don’t give her what she wants you’ll get almost nothing in return. Pinot Noir is the true woman of the wine world. No woman that’s worthwhile is ever easy to get, and Pinot is definitely NOT easy. Many court this fickle little fruit, but few succeed in winning her over. So I must congratulate Dag Johan Sundby, because he courted her, he got her, and she is giving him her all! Wait, you don’t know who Dag is?!? Well let me just go ahead and remedy that. Dag Johan Sundby is a native of Norway who had a deep seeded love for Pinot Noir, much like myself (except for the Norway part). His dream was to create world class wine from this elusive little lover of his. One problem with this scenario, Dag’s first hope was to have vineyards in Burgundy, but the cost of land was simply too prohibitive. This is lucky for those of us in the United States, because his back up plan was Willamette Valley in Oregon. So in 2004 Dag packed his bags, moved to the good ‘ole US of A, and purchased 175 acres of land in the middle of the valley. He didn’t buy just any plot of land, but a plot of land that lies immediately adjacent to the magical Van Duzer Corridor, which acts as a chimney running through the heart of the valley carrying cooler maritime winds to those along it. This makes a huge difference for the vineyards that are blessed with it, as during the peak of the summer this can mean a 3-5 degree difference in midday and evening temps. Think that doesn’t sound like a lot? Trust me, it’s huge. Lower temps mean lower alcohol, lower fruit concentration and higher acidity… all of the things that are important for world class Pinot Noirs. Ok, ok Derek, let’s get to the meat of it… what’s it taste like for crying out loud!? Well, in short… Awesome! No seriously, all of the wines from Johan are beautiful, and the entry level Estate Pinot Noir is no different. The wine is medium bodied in the glass. On the palate the first thing that makes itself apparent is the high tone acidity that just brings your mouth to life. You’ll find distinct notes of ripe cherry, raspberry and hints of dried cranberry accompanied by subtle pantry spice, black pepper and earth tones. The wine is aged in French barrel, approximately 1/3rd new, and this makes itself known closer to the finish, along with very soft tannins which help complete this liquid symphony. Mr. Sundby only produces roughly 900 cases per vintage, so this gem isn’t the easiest to find. You can always order online directly through the winery (www.johanvineyards.com), and there is a degree of presence in major markets. Oh, and a parting note… If you can get your hands on any of the 2010 Estate Pinot Noir, buy as much as you can! Johan didn’t bottle any of their single vineyard wines that vintage, it ALL went into the Estate. You’re talking about some crazy good juice for the price!!! As far as scores go, Johan is flying under the radar, just the way we like it! But I too am under the radar so it’s ok if I do it… haha. My score for Johan’s Estate Pinot Noir… well I need to split that up. 2010 vintage, 93 points. 2011 vintage (about to be released), 91+. So that’s my article, that’s my opinion, that’s my story, and I’m sticking to it. New content coming soon, in the meantime open a bottle of kickass, small production Pinot Noir and relax. Life is short, enjoy it! 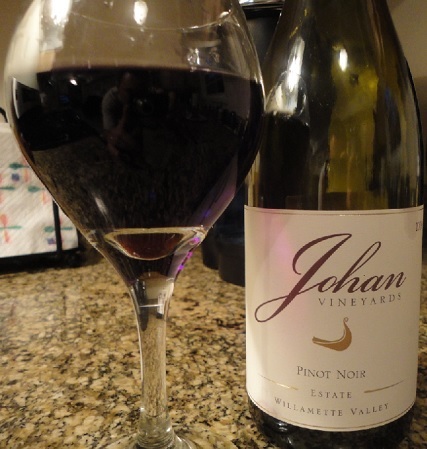 Tags: dag johan sundby, johan pinot noir, johan vineyards, pinot noir, willamette valley. Bookmark the permalink. 1. i love pinot noir, and 2. i live near a total wine in DE – SOLD!! My pleasure Dag, thank YOU for making amazing wines!